Girls’ leadership is crucial to their economic empowerment and therefore should be an important part of programme design. Developing the leadership abilities and the opportunities within the programme for adolescent girl and young women participants creates a pool of potential coaches, facilitators and female leaders for your sport programmes. This, in turn, increases the potential for these girls to grow as leaders in their communities. One of the most powerful ways to build leadership qualities in girls is to create formal leadership roles for girls. When girls are expected to lead others – through formal positions or informal relationships between girls, for example – they find power within themselves that they might not know existed. Creative programme leaders and coaches find subtle ways to facilitate this process and support all forms of leadership. For more information on general programme design, see the International Guide to Designing Sport Programmes for Girls Programme Design. The pathway to leadership and economic empowerment is not a linear progression through a step-by-step process of increasing responsibility, but instead must respond to broader needs and to the context in which a girl lives. Despite this variety of needs, Women Win has identified a generic pathway to move a girl from player, to peer leader, to coach, to intern (employable/job-ready), and finally, to employee or entrepreneur/self-employed. In addition to supporting girls’ economic empowerment, a focus on LEEP can also lower cost per participant (CPP) and lead to organisational benefits. 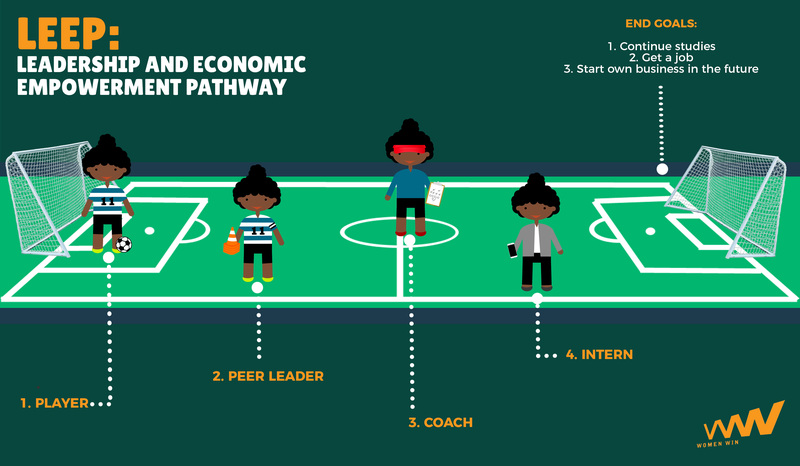 As girls gain the skills to be effective peer leaders and coaches, some will have the interest and ability to learn the broader skills needed to become programme managers able to sustain and scale a sport programme. This is important for both the organisation as well as the AGYW, providing them access to jobs in sport related industries. See the Sport and Economic Empowerment Section of this guide for more information. Creating this career path for AGYW is both a design and operational challenge for any organisation. It requires rethinking the lifespan of a sport programme, and the plans for concluding programme implementation. While this approach requires a period of initial investment in training at the higher peer leader, coach and employability skill levels, Women Win programme partners applying peer leadership models report that they see the benefits of scaling impact and lowering CPP over time.